When I received Charlotte's email asking me to consider writing an End Frame article for On Landscape a swirl of photographs immediately began to spin as if in a washing machine in my mind. 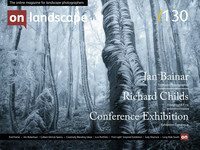 Many classic landscape photographs to choose, from the work of so many classic landscape photographers. The spin cycle finished and when everything settled I opened the door. Out came photographs from the famous and the mighty and I mentally hung them up for inspection. Yes, all great in different ways. Perhaps the old ones are slightly faded and the newer ones are definitely more vibrant, but all are very wearable. I let them dry for a while before turning to the washing line again. Something seemed to be missing, so I returned to the machine feeling uneasy that I had left something in there. I had indeed overlooked an item, and on reaching inside, looking like that favourite old shirt that should probably deserve a gentle hand wash but never receives one, I pulled out Fay Godwin's 'Four trees, Rannoch Moor'. We live in a world today that allows us access to maybe too many images of the Scottish landscape. For example, do we really need to see yet another image of the Buchaille? Be different, show me something exceptional, or I may think that I could have done better and both our time will have been wasted. Having such vision is a difficult thing to achieve and I'm smiling as I write this as I know from personal experience just how difficult that is, and how I feel I fail miserably most if not all of the time.